Perfect size crafted for 7 inch vinyl. Superb quality hand crafted solid wooden record crate. 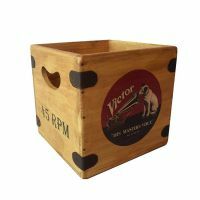 Great storage for vinyl collector & make perfect gifts music fans. Solid wooden record crate featuring unique prints & designs. Over 20 designs choose from! Be quick there are only a very limited number of these fantastic boxes available .